as well as the latest controllers to network your entire compressed air station. The system extensions do not affect the footprint of the compressor at all. In this version, the refrigeration dryer is integrated in the system to save space. The compressor is used to supply the dryer with power, control it and protect it against freezing ­if ­operated­ at­"underload".­The­ parameters ­of­ the­ refrigeration dryer are exactly tailored to the respective kW ­class­ and ­the­ dryer­ cannot­ be­"bypassed". All­ variants ­are­ also ­optionally­ available ­with­ energy-­saving speed control. The operating pressure can be adjusted steplessly from 5 ­to­ 13­ bar.­The­ high-quality ­frequency­ inverter­is­ easy­ to ­access in the control cubicle – an optimised cooling air guide provides optimum ventilation. Inverters and cables are­ electro-magnetically ­shielded. 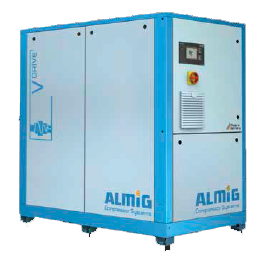 compressed air can be converted almost entirely to usable heat;­for­ example,­as­ hot­ water ­for ­feeding ­into­heating­ systems or for heating process water or industrial water. The constant temperature of the heat recovery system ensures reliability. The­ G-DRIVE­ and­ V-DRIVE­ screw ­compressors ­are­ very ­easy to maintain : all components are easily accessible from­ one­side ­and­ the ­large ­sound-insulating­ doors ­are easy to remove. This reduces the maintenance and down-times to a minimum, and ensures that the service costs are completely manageable.